I was knocked down (hard), and the mere thought of doing anything physical for an extended period of time exhausted me, both mentally and physically. When I first started "running" after I finished my cleanse, I could not run from telephone pole to telephone pole without losing my breath. It was hard for me to even fathom being able to run a 5k, but it was harder for me to let my body be knocked down by the unwelcomed intruder. I've really never been one to "show off", but I am a little bossy, so there was no way I wasn't going to get back up after being knocked down. Since being diagnosed with the Big C, it's been difficult for me to consider myself as being healthy. I feel tainted...my clean bill of health was rudely vandalized. I've talked before about the Tamoxifen and the lovely side effects that come along with it; exercise counteracts those side effects. Those are just a few of the reasons I started to run, and today, as I ran and completed my first (ever) 5k, I realize that it really is so much more than a road race. After I hit the two mile mark, with music playing in my ears, I looked at the other runners around me and thought, "I wonder what their stories are". I'm certain that for many of the participants in today's race, it may have been just a road race. But for countless others, surely it was more than that. As I started to create stories for each runner in my head, I looked up to see my family, jumping and cheering for me on the sidewalk. They are it! They are the MORE. I "run" for me, but I also "run" for them. The Big C can feel like it shakes the ground viciously below your feet, but when you get back up, and fight back harder than you've ever fought in your life, it's a feeling of victory. Today I ran a 5k with Shannon by side the whole way, in many ways representing the crew I've had by my side through my entire Big C journey. We ran together the entire way and crossed the finish line at the same time. This was a good reminder that I am never alone in this journey we call life. I have an abundance of love and support from my family and friends and I am truly grateful for all of them. 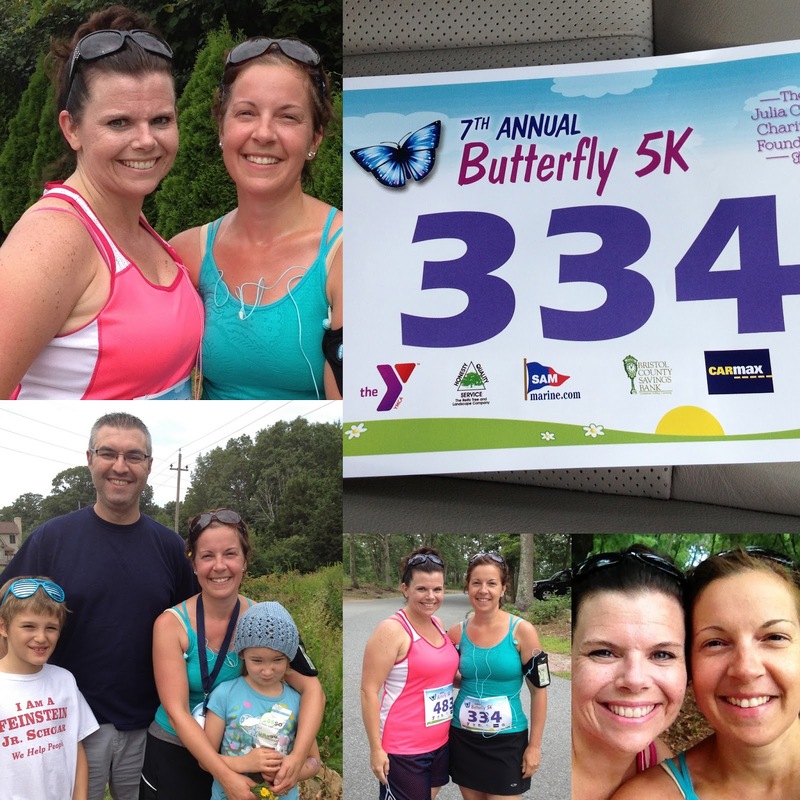 And, how about the fact that my first 5k was the Butterfly 5k? This 5k benefits a foundation for a little girl whose life was short, but whose significance and legacy continue to thrive.